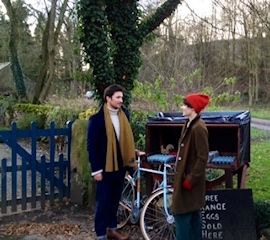 Another business at the heart of cycling in the Peak District is Glory Days, who offer retro and vintage bike hire from their base in Bakewell. This post is a question and answer with Glory Days to discover what the motivation was behind the business and the most unusual reason for a bike hire. What was the motivation behind starting Glory Days vintage bike hire? Eroica Britannia was the reason behind our start up. We had been to L’Eroica Italy the proceeding Autumn and realised there was a market for vintage bike hire attached to the event, especially for participants coming from overseas. For many years we’ve had a love of hand made bikes and their stories. William rides a custom built Alves from Scotland and Carol a Vernon Barker hand built in nearby Dronfield. We love the idea of recycling and giving a bike a new lease of life is very satisfying. Why do you think a vintage bike is the best way to explore the Peak District? A vintage bike is a good excuse to explore the countryside at a leisurely pace. All our bikes are the best of British. We think back to when riders from surrounding cities used to come to the Peak District on their steel tourers for camaraderie, fun and fellowship’ and of course still do. Arriving at a cafe on one of our beautiful machines is always a talking point! Do you have a favourite vintage event? 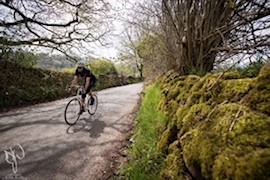 We have done L”Eroica Tuscany a couple of times, La Superba in Italy, La Belvedere in Switzerland and L’Ancienne in the Lake District, not forgetting the amazing Eroica Britannia of course, it’s not easy to say but Eroica Limburg – 3 countries in a day – is one fantastic gravel ride. 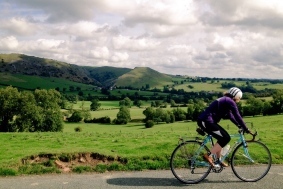 What are your hopes for the future of cycling in the Peak District? We’d love to see more people cycling to and around by bike and less bikes on the back or cars getting to the destination. It would be great if there was more of an ‘everyday’ cycling culture with all ages cycling to and from the shops and work on a good network of well connected and convenient cycle routes. We hope that all cyclists will continue the tradition of waving to each other as they pass on the roads. Where is your favourite place to cycle in the Peak District? There are so many great routes but Long Dale into Hartington and the lanes around Hartington, Longnor and Alstonefield is our favourite area. Tell me about one of your favourite moments cycling? We’ve done some great cycle tours. Cycling down the Engadine Valley this summer on our retro tourers with fantastic scenery on a long traffic free bike route (Euro Velo 7) was one among many. What’s the most unusual reason for someone hiring one of your bikes? A stylist working for Visit Britain got in touch to do a photo shoot promoting the great British countryside and wanted to feature the models riding and posing with our bikes because they are so photogenic. We also had a request for five matching Raleigh Record Sprints for a wedding. What are your future plans for Glory Days? To do what we do even better and to exceed customer expectations. We are constantly improving our stock and components such as better wheels and tyres. All our bikes now have leather Brooks saddles and tool bags with spare inner tube and mini pump. We collect and deliver our bikes free of charge throughout the Peak District. In 2017 we hope to attend more events with our pop up booth and work with accommodation and food providers to develop and promote our guided cycle rides.